Going back to the basics, experiencing the classical, easy going, relaxed vibe of the true longboarding spirit, while getting great pleasure out of the ride, are some of the wonderful things that this 39-inch longboard has to offer. This is a quality piece of gear, yet it has an unusual feature in the face of its budget-friendliness. The shape, design and hardware serve to compliment the deck in all the best ways. 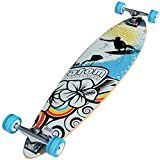 This is one longboard that can be counted on, as it is stable and enduring, a great choice for any beginner who would like a fantastic experience from the very first time. The deck is a key feature of any longboard – after all, it is what the skater steps on, and so it should be able to provide worthy levels of comfort and stability, while making sure that the ride is care-free and enjoyable. Moreover, a low-quality deck might make beginners weary of the experience, rather than accentuate all the wonderful sides of longboarding. This unpleasant turn of events is eliminated with the deck featured here, as it is fairly big, though not too bulky, laminated with maple, fully covered in quality griptape and, last but not least, shaped in a classical and practical manner. 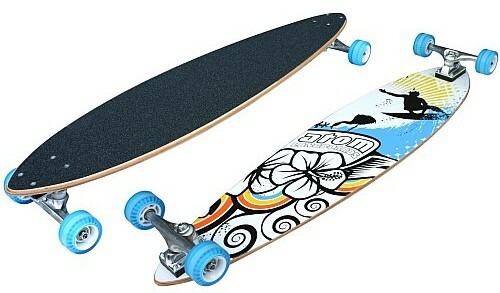 This longboard has a Pintail shape, which means that it is equally elongated both at the front and rear. That is the classic shape, the surf-inspired way in which longboards were molded in the beginning. As is the case with many things, going back to the classics proves to be an advantage – the board is aerodynamic, stable and there is almost no danger of any wheel bite forming. All of this is just perfect, especially for beginners, because it means that the rider won’t need to constantly fix and worry about the board, but will rather be able to enjoy the experience. This shape is perfectly suited for cruising because it provides stability and maneuverability, both great for avoiding pedestrian traffic overcoming urban obstacles such as cracks on the pavement. Even though the deck is one of the most important features, the rest of the gear is not to be overlooked either. The Atom Pintail Longboard has some very good features to offer, such as its trucks, bearing and wheels. The trucks are 8.5 inches in size and are made out of aluminum, which is a strong, yet lightweight material that is fairly enduring and can easily withstand most climate conditions without getting damaged. 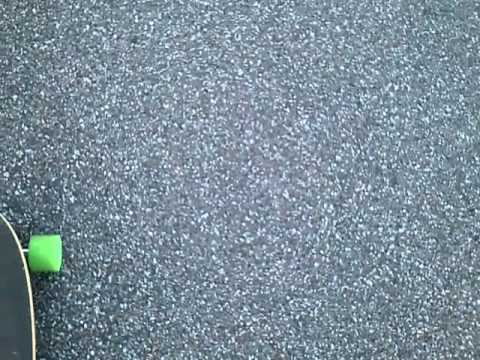 The bearings on this longboard are ABEC 5, which means that they are not the best in the market, but are very suitable for beginners who are not yet used to the highest of speeds. The wheels, on the other hand, are one of the supreme features of this longboard – they are 78A urethane wheels, which means that the grip with the pavement is excellent and there is not room for fear of instability or uncontrollably high speed. One detail that should not go unnoticed when it comes to this longboard, is the amazing design. Not only is the ride super smooth, but the designs serves to transport the rider to a chilled out, tropical paradise where skating is an entirely new level of pleasure. On top of that, the board is rather affordable, making it an excellent choice for each and every novice experience.